In most workshops space is limited. So you need to find a way to utilize every bit of space that you can. One area that is often overlooked is the space underneath shelves and cabinets. But this can be a great place to store small tools. All you need is a magnetic strip that is mounted to the bottom of the shelf or cabinet. In this project, I am going to show you how to make simple magnetic plates that you can use to mount small hand tools. Ceramic Bar Magnet 1 7/8" x 7/8" x 3/8"
First you need a strong magnet. I am using a 7/8" x 1 7/8" x 3/8" ceramic bar magnet. This is a very common style of magnet. You can purchase it at many hardware stores or at Radio Shack. Other magnets can also work. Just make sure that they are strong enough to support the weight of your tools. Using your tin snips cut out a 1.5" x 3.5" rectangle from your piece of sheet metal. We will use this to make the frame that will hold the magnet. You can purchase steel sheet metal at most hardware stores. Alternatively, you can just cut up scrap metal that you have lying around. Place your magnet face down on the center of the cut piece of sheet metal. Then using a pencil or a fine tipped marker, trace the outline of the magnet. When you remove the magnet, you should see a clear outline. Using your pencil (or marker) and a ruler extend the lines of each side of the outline so that they go all the way across the sheet metal. This will make a grid of nine rectangles on the surface. Using your tin snips, cut off the rectangle in each corner of the grid. This will give you the shape shown below. Place the Magnet in the center of the sheet metal. Hold the magnet firmly in place with one hand. Using your other hand, bend each of the four tabs up 90 degrees. The two end tabs should be sticking up past the edge of the magnet. Using a pair of pliers, fold these down 90 degrees so that the face of the sheet metal is flush with the top of the magnet. These will be the mounting tabs. Now you need to make screw holes in the center of each of the mounting tabs. You can either drill holes or you can punch holes with a nail and hammer. The last step is to secure your magnetic mounting bracket to the bottom of a shelf or cabinet. To do this, hold the bracket up to the surface and use your pencil to mark the mounting holes. Then use a drill to make guide holes in each location. Lastly use a pair of wood screws to secure the bracket in place. 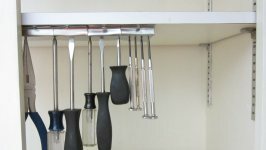 You should now be able to hang small hand tools from your magnetic bracket. You can hang anything that is made of steel and is light enough for your magnet to hold. I prefer to use it for small screw drivers. If you wish to have a larger mounting surface, you can either make several individual brackets and mount them side by side, or you can make larger brackets with multiple magnets. To make larger brackets, the procedure is basically the same. You just need to use a larger piece of sheet metal. For ever additional magnet add one inch to the width of the metal. This will allow the magnets to be spaced out a little. So for two magnets the initial sheet metal should be 2.5" x 3.5". For three magnets, the initial sheet metal should be 3.5" x 3.5" and so on. It can be difficult to fold up the sides if they are too long. If this is the case, it may help to cut the sides into sections of two or three magnet widths. The shorter sections should be much easier to fold. The magnets can support more weight if they are all in the same orientation. But this makes it difficult to secure them in place because they want to repel each other. So be careful to keep the magnets aligned when inserting them.